A few days ago, the National Park system was closed down. This closure has affected Santa Barbara Adventure Company’s operations within Channel Islands National Park. Hopefully this matter will be resolved soon so we can get back to our job of guiding amazing trips. Until then, we are getting lots of calls and questions from scheduled guests. Here are some answers to the most frequently asked questions. Sea Cave Kayak trips operate in the National Park which is now closed, therefore our Sea Cave Kayak tours are currently not operating. All mainland trips – Coastal Kayaking, Wine Tours, Surfing, SUP, Hiking and Biking are running as usual. The State Beaches and City Harbor are still open. My trip is coming up soon, so what are my options? 1. Wait and see if the park opens before your reservation date. We will call all guests a few days in advance of their reservation and give them an update. 2. If you are booked to go within the next two weeks, you may cancel your trip and get a full refund with no cancellation fee. 3. 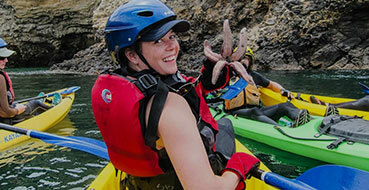 You can switch to a coastal kayaking tour and be refunded the difference in price. 4. You can reschedule to a later date with no change date fee or hold your credit with us if you do not have an alternate date yet. Are you taking new bookings? Yes, you can still book for future trips with us with the hope that the Park reopens before then. Why are you cancelling my trip? The Federal Government did not pass a budget so there are no funds available to keep the National Parks open. Once a budget has been passed the parks will reopen. All National Parks were closed until further notice from October 1st. My trip was canceled; will I get a refund? Yes. You can get a voucher for a future trip or a refund. If you would like to go on another trip, just let us know. We offer some incredible coastal options and the State Parks are still open (El Capitan State Park and Refugio State Park). When will I be able to go to the park? We do not know. As soon as the shutdown is over, the Park will reopen and we will resume our Channel Islands tours immediately. Can’t we kayak and not go on the island? As the National Park encompasses a one mile radius around the islands, kayaking around the islands on non-landing trips are also prohibited until the park reopens. Additionally, there is currently no ferry service to the islands. How are you affected by the shutdown? Thank you for all those who have emailed or posted words of support during this challenging time. We would very much like to see the government reopened and the NPS operating. At this time we are greatly affected and every day is taking a financial toll on our business and staff who are out of work. Please call and email your representative, it is time to work together to resolve this issue and do the job you were elected to do. Thank you to all of those who have called their representatives to urge them to pass a budget and get the parks reopened. We appreciate the outpouring of support we have received from the community.